This number is, unfortunately, the amount of dollars that jerk-who-stole-my-phone-and-held-it-for-ransom-before-dissappearing racked up on my phone before we shut the line down. Lama, mid 30's, is a doctor specializing in high level tissue something or 'nother, too complicated for my brain's limited understanding of the medical field to remember. In June she is marrying a Palestinian refugee (also a doctor) who has been living in England for the past 20 or so years. She is trying to practice English in the hopes of passing a language proficiency test in the UK that will allow her to practice medicine there. Each session I come away freshly amazed at her work ethic, determination, kind heart, and open mindedness. My favorite story so far is about how she got into medical school. Medical school here starts at the bachelor level and so they study in medical school for 7 years before moving on to residency work and all that jazz. Initially she got into the science college, but not the medical school. She told me that she took all the classes that first year medical school students take with the intent to do better than any of them and make an appointment with the Dean to show him her scores and ask to be let into the Medical school. Actually, she said it to me with a little more force than that "I told him that I had good enough grades to be in the medical school and that he couldn't deny my dreams of becoming a doctor". And doctor she is. For some reason lately we have been talking a lot about death and marriage customs in the Middle East. Did you know that when someone dies in Palestinian culture the tradition is to have something akin to a wake for 3 days where people visit the home and offer condolences, but only black coffee and dates are served? It's sometimes hard to tell what customs are Palestinian, Arab, Muslim or some combination of the three. Lama grew up in Dubai so we talk a lot about the differences between Gulf Arabs and Levant Arabs. A lot of money and more conservative traditions are what we have covered so far. Getting a sense for the rainbow of Islam that is practiced throughout the Middle East has been the most illuminating thing for me actually. The "Arab World" is just as diverse as America - think Seattle Vs. Georgia, Texas Vs. Maine. Really. On numerous occasions Lama has expressed ideals of universal respect, social responsibility, unconditional kindness, tolerance, hard work, and out and out goodness to me. We have talked about the role of travel and learning to eliminating prejudice, the traditions of culture vs. the actual doctrine of Islam, the beneficence of God towards all of his children, and the importance of true spiritual conversion and living charity over seemingly good acts done without pure intent. I wish I could take her home with me, hitting junior high schools, Kiwanis Clubs, churches, and town hall meetings all the way back to Utah. I feel strongly that it's important to grow our understanding of Islam to one that incorporates all kinds of Muslims - not just the bad ones. The first day we met she told me that it had been suggested to her that if she took off her head scarf she could fit in better when she moved to England. She talked about how she chose to wear it as a symbol of her commitment to God and that she wouldn't take it off to 'fit in'. She went on to talk about how it would be good for people to see her wear it and get to know her outside the stereotype of scarved Muslim women. "When people get to know me, they will not see a head scarf, they will just see me." It made me so happy to think of independent, kind, wise, devout, thoughtful Lama busting around the world shattering garbage stereotypes. That is my weight, in pounds, as of yesterday (beard included). Down from 230 last July. If I had to describe how I did it (and it’s a blog, so I simply must), I would describe it as a question of inputs and outputs. Inputs: Brooke and I are practically vegetarian at home: we eat lots of beans and vegetables with fresh fruit and multi-grainy bread and we only really eat meat when we go out to restaurants. We still eat sweets and desserts, but portion sizes in Israel are about half what they are in the States and food is much more expensive. Drinks are much more expensive and there are NO FREE REFILLS. That means very little (if any) sweetened carbonated drinks get consumed every day. I just need to emphasize as well that without Brooke’s amazing culinary mastery, I would not have such a high quality of life or eat such a delicious variety of foods. I eat four meals a day, which teaches my body that it can devote resources to building and strengthening muscles instead of converting it to fat (which would happen if you only ate once or twice a day). Outputs: I walk to and from campus every day (which is about 40 minutes round trip), but the biggest difference has been made by consistent effort at the gym for the past seven months. This means two or three 90-minute workouts per week with most of the time dedicated to strength training of the major muscle groups (legs, back and chest) and each workout beginning with about 20 minutes of cardio warm-up. I have developed an A-day, B-day schedule where the A-day program focuses on the chest, shoulders and triceps and the B-day program focuses on back, lower back and biceps. So with three workouts a week, this means that I will have an A-B-A week followed by a B-A-B week and so on, which gives each major muscle group ample time to rest and rebuild itself between workouts. The results: thus far, I have lost 30 pounds and about 5 inches off of my waist. I feel that I have much more stamina for prolonged activity like walking and climbing stairs, and cleaning tasks at home (washing dishes, cleaning the bathrooms and doing laundry) are much less exhausting to me. According to the Body Mass Index (a quick and dirty method of measuring the state of your body) I have gone from Class I Obesity (the lowest class) to merely Overweight. Hooray? The shortcomings of the BMI are important to keep in mind (especially since the method does not differentiate between lean muscle mass and body fat), but it is a simple way to determine where you stand and I’m at least going in the right direction. Hooray. But the BMI is not and has never been the measure I’ve had in mind since beginning this experiment in healthy living. My mantra has always been this: gain strength, lose excess weight. That’s it. I don’t really have a target weight or even a target physique in mind, I just want to improve what I have and lose what I don’t need. In the meantime, it has been very gratifying and enjoyable to see the strength gains enumerated in the kilograms I can bench press (about 85) and how many pull-ups I can do at a time (about 13 as of April) as all of the exercises I have tried and enjoy. I had to start at a very basic level, since it had been almost a year since I’d undertaken any serious physical exercise. I couldn’t do one pull-up, one bar dip and I was barely able to jog for 5 minutes straight. And my muscles were angry at me for putting them through so much and for about two months I didn’t feel or see any noticeable difference. But by that point, I was looking forward to going to the gym, I was mentally planning my workouts and hoping that I could surpass what had been achieved that last time. I’ve been hooked ever since and the noticeable improvements in stamina and physique have only helped to encourage me. So why blog about this? Merely to brag? Well, yes. But most importantly, to show that it can be done. It’s like Gene Wilder in Young Frankenstein screaming to the night “IT. COULD. WORK!” I bought a book about a year and a half ago called Fitness Made Simple. I read most of it and didn’t even bring it to Israel, but I credit that book with one important contribution: it convinced me that living a healthy life was possible. This was a major change for me, as I always had this idea that I just couldn’t improve upon what genes had given me. The fact is that with dedication, discipline and a willingness to accept gradual improvements, you can see great things happen. As often happens, I get started on one project that kind of spirals into several. I do a lot of work in a flurry and then don't make anything for a while. But whatever. It's my art and that's the way I want to do it :) So, I finished the book I mentioned previously...and a few others. This book will be a photo album from our time in Jerusalem. Max is going to write Israel/Palestine in Hebrew and Arabic (respectively) and I'll put it in that indented space on the front. It opens left to right, like Arabic and Hebrew books do. I made this paste paper (not the paper itself, but the design on it) a few weeks ago and it was the only one to turn out decent from the whole batch. I chucked the rest. BUT I am going to try and make some more paste paper this weekend. I'll blog about my results if things turn out well. 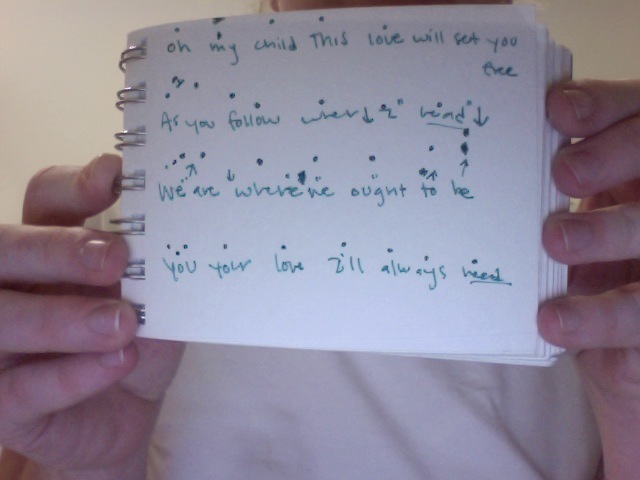 This book deserves a little note and a thanks to my Mom. Someone came to visit us when we first got here and she offered to bring something for us. I wanted paper. My Mom probably thought I was a little loony, but paper she sent - this orange mosaic piece among them. I don't know if my Mom always understands me, but she supports me and that means a lot. She's the best. This book is made of one signature (folded pieces of paper). It's a good way to make a sturdy little book. Try not to get too creeped out by the extreme brotherly beardedness about to ensue, but this is our new favorite song. Families matter and they are special. It's a Zen thing, like how many babies fit in a tire? For some reason I've slipped into a blogging slump and I just can't get worked up to writing about anything. But a recap for the past few weeks is probably called for. -My bookbinding class is going very well. 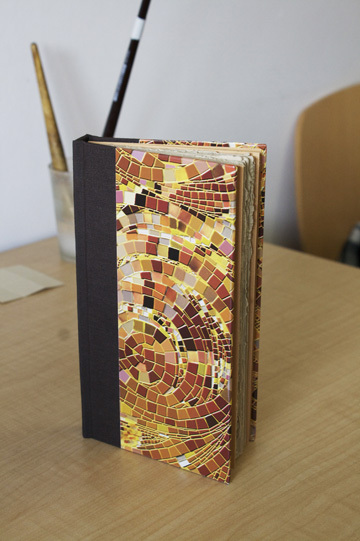 My teacher is one of the most eclectic, amazing people I've ever met AND a fine bookbinder. One of the many awesome life experiences he has shared with us came out last week - he used to be a Franciscan Monk in Canada, and now he's a Jewish bookbinder in Israel. I'm really lucky to have found him and to be in class with a few really talented artists. I feel a little bit like I'm wearing an art training bra when they talk about their many experiences, but that's how you learn. I'm working on a rounded spine book right now that should be finished next week. -I am teaching more English classes than I wanted to this semester, but I am glad for the money and the experience. I have actually picked up private lessons with a fabulous Muslim woman from Dubai in her 30's. She is a Doctor and studies some high level Cancer tissue something that I wasn't medically well read enough to understand. But she is preparing to pass the British equivalent of the TOEFL (A language proficiency test they give in America) and we meet about three times a week. She is wonderful and it makes the added hours not so difficult. -We have weekly mini-panics about leaving here in only 6 weeks. When we first got here we were really good about going out and seeing all the things we wanted to right up front. There are about 3 museums still on our list, but otherwise we feel really good about accomplishing the things we wanted to here in Israel. Our panics come mostly from the realization we will be leaving the many great friends we've made here. I've never been very good at keeping in touch with people, but I'm getting better. I can't bear the idea of making good friends and then leaving them every 2 years for the rest of my life SO my motivation is high to learn this skill. What could be nicer than handpicking friends from amazing people all over the world? Hello friends, I wanted to write a few lines about a day of national observance that just passed here in Israel, Yom HaShoah or Holocaust Observance Day. The day is marked on Israeli calendars soon after the Passover holidays, and immediately preceding the holidays marked to commemorate and memorialize the fallen soldiers who fought for Israel's existence (Yom HaZicharon) and Israel's Independence Day (Yom HaAtzmaut). The ceremony of Yom HaShoah is broadcast across Israel and the world from Yad VaShem in Jerusalem, where the Prime Minister and the President of Israel, along with Holocaust survivors and their families, light six lamps in honor of the six million Jews killed by the Third Reich. At sunset, sirens are sounded in every populated area in Israel for a whole minute and life stops in the streets and schools of Israel. The same sirens are sounded the next morning and I saw pictures in Haaretz and other Israeli publications of people stopping their cars in the middle of the street and standing beside them while the sirens went off. Professor Frosh, who teaches my Mass Communication in Israel class, said that the Yom HaShoah ceremony is marked by a "national mood shift" in all available media. National radio and television stations broadcast programming that reflects the somber nature of the days surrounding Yom HaShoah and Yom HaZicharon. Music, movies and shows focus on the era of World War II and the loss suffered by the Jews and others at the hands of the Nazi regime. He also explained that the date was selected for Yom HaShoah because of the Warsaw Ghetto uprising which was occurring at this time in 1943. I would recommend the film The Pianist which details the resistance from within the ghetto and the crushing counterassault leveled by the SS. It is also something for me to live in French Hill on Lohamei HaGeta'ot Street, which means Fighters of the Ghettos. Uncle David saw himself as a child of his time: a distinguished, multicultural, multilingual, fluent, enlightened European and a decidedly modern man. He despised prejudices and ethnic hatreds, and he was resolved never to give in to lowbrow racists, chauvinists, demagogues, and benighted, prejudice-ridden anti-Semites, whose raucous voices promised "death to the Jews" and barked at him from the walls: "Go to Palestine!" To Palestine? Definitely not: a man of his stamp would not take his young bride and infant son, defect from the front line and run away to hide from the violence of a noisy rabble in some drought-stricken Levantine province, where a few desperate Jews tried their hand at establishing a segregationist armed nationhood that, ironically, they had apparently learned from the worst of their foes. No, he would definitely stay here in Vilna, at his post, in one of the most vital forward trenches of that rational, broad-minded, tolerant, and liberal European enlightenment that was now fighting for its existences against the waves of barbarism that were threatening to engulf it. Here he would stand, for he could do no other. I think the most important idea I came away with from my undergrad class on the Holocaust was the sense of how many Jews in Europe were either dedicated to that continent and were confident in its modern, egalitarian character and those who were trapped where they were and would have had nowhere to run even with the means to do so. There were many who sensed the danger about them and attempted to flee, only to be repulsed by other nations (including the UK, Canada and United States) and sometimes sent back into the waiting arms of the Nazis. Others, like David Klausner described above, refused to leave their countries due to their faith in European ideals and were killed for it, along with millions of others. A few days ago, I finished reading a book by the UN Force Commander who was present during the genocide in Rwanda. This book made the point that the world's conscience should have been seared by the memory of the Holocaust sufficient to prevent any similar, subsequent targeting of groups for wholesale extermination. Romeo Dallaire, the author, laid bare his personal feelings of failure and uselessness while the slaughter occurred around him and I have to wonder: does the world have a conscience? Does it have a memory? Can it be trusted to learn from these horrific killings and prevent future genocides? 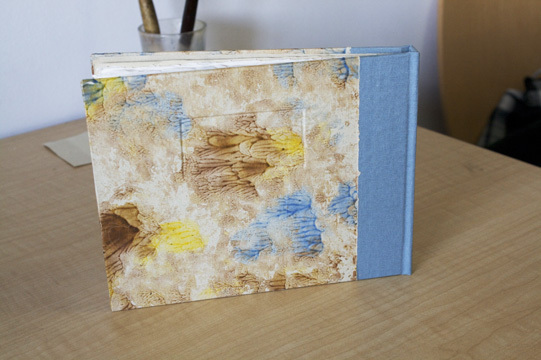 I got so excited about the photo book I'm making (from my own paste paper) that I have forgotten to eat today. It's 2:00 P.M. I think I'll get right on that. New book pics coming soon! Hello friends, this is Max. I have been woefully absent in my blog-making duties and I am here to remedy that with a description of the wonderful Passover Seder that Brooke and I attended last week. My graduate coordinator Ronen had sent an email asking if anyone wanted to attend a local family's Passover meal during our two-week vacation and I said that we would love to. So he had me call a man named Edi, a rabbi in the on-campus Conservative Movement. I'd actually attended one of Edi's 'Lunch and Learn' seminars and I looked forward to the first night of Passover when we would go with him to evening services at a synagogue just north of our dorms and then to his house for the Seder. My knowledge of the Exodus story comes down thanks to many a Sunday School lesson, Bible reading and not a few television and movie adaptations. I also learned how to sing and accompany on guitar a song called "They Tried to Kill Us, We Survived, Let's Eat!" which has an irreverent, woefully inaccurate and hilarious take on the Passover story. In a nutshell, the Passover Seder is a way for Jews in every time and place to re-enact the hasty meal taken by the Hebrews in Egypt before fleeing into the wilderness on their way to the Promised Land. As such, leavened bread is a no-no in Israel at this time, since only un-leaved bread (called Matza) can be eaten for the entire festival week. All of the stores in the Jewish neighborhoods have the equivalent of Kosher police tape around all of the "chametz" or products that are made with leaven. So last week we walked up to the synagogue and found about two dozen people settling in for the evening services that include prayers and recitations of the Torah just as the sun is setting. Edi donned the tallit and led some of these prayers and before we knew it (and certainly before we could find our place in the prayer book) the services were over and we were walking back to Edi's apartment with two undergraduate students who also lived at the dorms and would be joining us for the seder as well. At Edi's apartment, we were greeted by his wife, two daughters and his delightful dog, Max. I had to keep reminding myself that when anyone in the room squealed my name, it was almost certainly meant for the pooch and not for me. We sat down to the table and at each place there was a small wine glass (Edi most graciously provided some grape juice for me and Brooke) and a Passover Haggadah, the book from which all the Seder readings would be taken. Over the course of the Seder (a Hebrew word meaning "order" or "arrangement" in reference to the order of the foods and the cups of wine to be taken) we drank four cups of wine. Matza is broken and given to each participant after eating a bit of potato dipped in salt water. 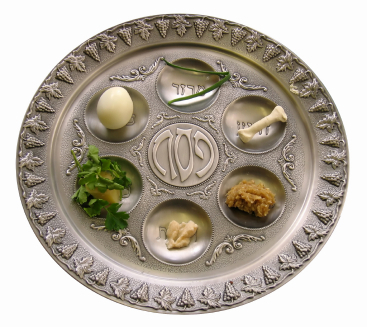 At this point, all who are hungry or alone are invited to come to the table to enjoy the Seder meal and hear the Magid, or retelling of the Passover story. We cannot celebrate the suffering of the Egyptians nor the suffering of any other human. Our joy decreases because of the plagues they suffered and this is why we remove these drops from the wine. For the rest of the evening, following a truly delicious feast of chicken, salads and other goodies, we sang and recited from the Haggadah songs of praise and I even helped recite some of the Hebrew verses in a delightful children's song at the end of the evening. We were shocked when we looked at our watches to find we had been at the dinner table for nearly four hours at this point! Time had simply flown away while we soaked up the loving and holy atmosphere of this sweet Jewish family that had brought us into their home to celebrate the miraculous deliverance of Exodus. Being a cheapskate and a lover of all things Rick Steves, I am always looking for cheaper ways to travel. I came across this website from a New York times article and booked a room in Rome today for 1/2 the price of even the cheapest of hotels in our guidebook. Airbnb, while I don't exactly understand the name, is a place where regular folks or budding bed and breakfast proprietors can list their properties on the internet, many at a fraction of what you'd pay in "regular" hotels. It's kind of like couchsurfing where people offer beds/couches around the world for free, but for some reason a little money put down made me feel less nervous about it. Maybe I assume there will be a smaller hippie count if actual dinero is exchanged? This website lists beds worldwide - including the US. What could be nicer than getting to know real locals when you travel? They can tell you the best restaurants, the best activities, and the best restaurants...did I already say that? But aren't you afraid they will rob you and remove your kidneys in the middle of the night? Well, I guess there is always that possibility. There is a review system where previous guests can comment on their experience, like tripadvisor (which I also use a lot), and I made sure to reserve a room that had many reviews - all positive. You can also report any inappropriate kidney removing activity to airbnb directly. Maybe they have a team of thugs on staff, I don't know. Anyway, I will surely report on our experience and if anyone has used or uses this service in the future LET ME KNOW. Our days of vagabond traveling are probably coming to an end as I don't know if Diplomats can busk their way through Europe. So viva la jobless life while it lasts.